Practice numbers with pumpkins these holidays! Number 2 worksheet has so many fun activities your kids will enjoy! Practice fine motor skills and make the outline of number 2 using playdough. Color the same amount of boxes under the number 2. Now your child ready to practice tracing the number 2. 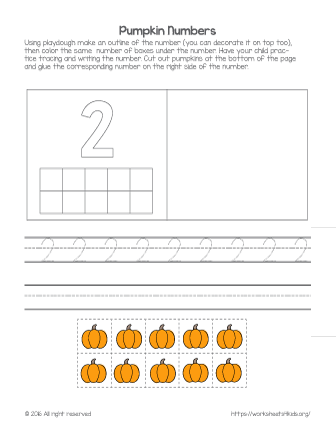 Cut out pumpkins at the bottom of the page and let your child glue the corresponding number on the right.